Chop, saute, roast, bake. Chop, saute, roast, bake. Decorate, decorate, decorate. That's what 50 or so members of Congregation Beth Shalom in the Richmond District did for hours in the days leading up to Thanksgiving. The temple smelled fantastic. Backs ached, feet throbbed and hands were tired, but hearts were happy. "Congregation Beth Shalom wants to prepare Thanksgiving dinners for families in need," Beth Jones, Manager of Membership and Congregation Relations explained to Food Runners founder and Executive Director, Mary Risley a few weeks before Thanksgiving. "We have a full industrial kitchen and many volunteers excited to take part," Beth continued. "We can easily produce over 100 dinners. We're not sure where to take our dinners. Can you help?" In typical Mary Risley fashion, Mary sprung into action, not only providing the names of some family shelters, but, in addition, promising that Food Runners would coordinate Food Runners volunteers to transport the dinners from Congregation Beth Shalom to the chosen shelters. Beth Shalom Thanksgiving dinner for a family of 4. On the Wednesday before Thanksgiving, excitement bubbled just below the surface all day for volunteers Karyn S., Debra R. and Jamie S., the three food runners who responded first to the call for the Beth Shalom run. At 2:15 that afternoon, the three gals arrived in their respective cars, ready to spread some truly meaningful holiday cheer. The fully prepared, deliciously fragrant dinners, all wrapped in lovingly hand-decorated bags, stretched out in a long line in the temple's courtyard, ready for pick up. 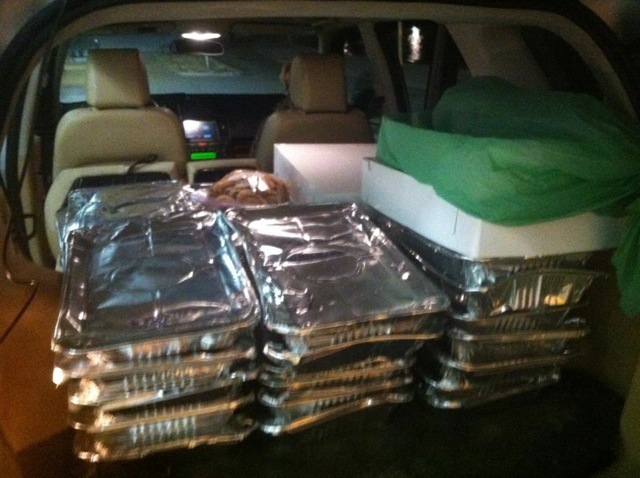 Dinners ready for pick up by Food Runners volunteers. The line of festive bags included complete dinners for 13 families (41 people total) for delivery by FR volunteer Debra R. to Compass Clara House in Hayes Valley, complete dinners for 21 families (75 people total) for delivery by FR volunteer Karyn S. to Hamilton Family Center near the Panhandle and last but not least, a communal meal with all the fixin's for 66 for delivery by FR volunteer Jamie S. to Compass Family Shelter in the Tenderloin. Wow. 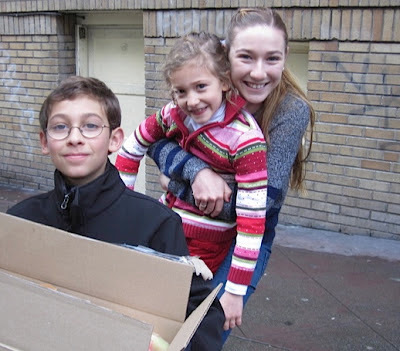 Food Runners and Congregation Beth Shalom rockin' it together for struggling San Francisco families at a time when struggling families often feel their struggles the most. Karyn S. with car fully loaded. Along with ending hunger and alleviating waste, creating community is one of the founding principals and ongoing missions of Food Runners. From Congregation Beth Shalom to Food Runners to Clara House, Compass Family Shelter and Hamilton Family, community abounded this Thanksgiving with all parties involved being the richer for it when all was said and done. What a great kick-off to the holidays. Food Runners style. Totally. Jingle, jangle, jingle. Holiday parties and events are in full swing. Do you know what's happening to the leftovers at the events you are attending? Tell the food staff about Food Runners. 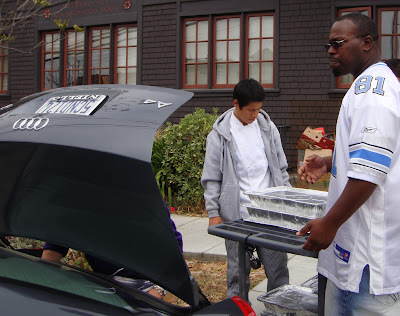 Food Runners volunteers will pick up the leftovers with a smile and make sure they are delivered to San Franciscans in need. Happy, healthy, hearty holidays to all! Got excess food? Call Food Runners. 415-929-1866. Gaggles of high school kids gather daily at after school programs like those at Oasis for Girls, Booker T. Washington Community Center, Seven Tepees or the Vietnamese Youth Development Center. The kids slouch, slink and be-bop simultaneously as only teenagers can. They could be your kids. They could be my kids. They look and sound like average adolescents. They laugh a little too loud. Some wear their skirts a little too high or their pants a little too low. Some sport piercings in all the wrong places and hair colors Mother Nature never dreamed of. Typical teens except that many of these kids have to make tough choices like whether to spend what little money they may have on food or bus fare to get home. Thanks to Food Runners, on some days, some of these kids get to use their change for bus fare instead of food. Every Wednesday afternoon, Food Runners volunteer Paul O. stops in at Heroku, a tech company in SOMA, where the lovely Celeste plies him with trays of leftovers from the day's catered lunch. The food is spectacular and the menus are always wonderfully healthful. No junk food at Heroku. Celeste makes sure the hard working staff at Heroku is eating well. Better nutrition leads to sharper minds. 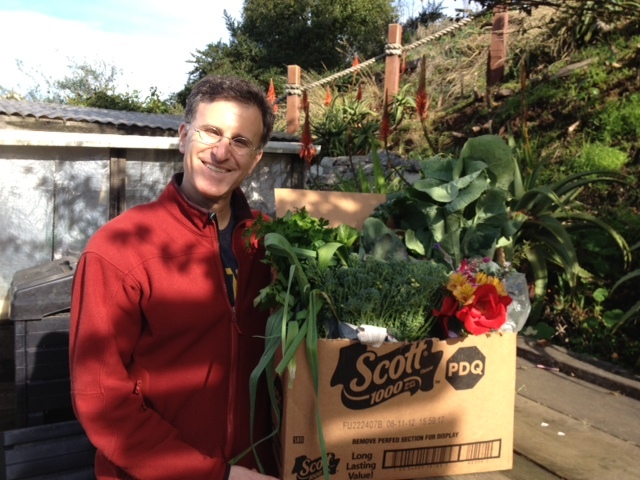 That goes for the young ladies at Oasis for Girls in SOMA too where Paul delivers the food. A similar routine plays out at Justin TV every Friday. Food Runners volunteer Courtney N. braves the traffic at the corner of Bush and Sansome where Ashley of Justin TV waits curbside with a cart stacked with anything from bowls of fresh salad, to trays of spring rolls to sandwiches; whatever Justin's lunch offering o' day consisted of. Courtney delivers the food to smiling young faces at the Vietnamese Youth Development Center in the heart of the Tenderloin. 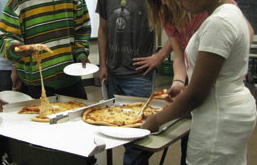 When Food Runners delivers to after school programs like Oasis and VYDC, the study areas get quieter. When Food Runners delivers to after school programs like Oasis and VYDC, the growl of rumbling stomachs gets replaced by the sound of pages turning in books and the click of fingernails on keyboards. 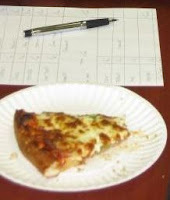 When Food Runners delivers to after school programs like Oasis and VYDC, tougher math problems get solved, harder words get spelled correctly, more homework gets finished and maybe, just maybe some kids inch a little closer to success because they can concentrate on things other than hunger. The ability to provide substantial, nutritious food at programs like Oasis and VYDC translates into greater attendance. This a refrain heard from staff at many of the after school programs Food Runners serves. Greater attendance means less time on the streets and more time focused on school work. Food Runners is proud to be a factor in that equation. Over the bridges and through the hills, to holiday feasts we go... Do you know what's happening to the leftovers at the all the dinners and parties you'll be attending this season? Tell the host/caterer/event coordinator about Food Runners. 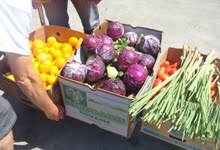 To donate food, they simply need call 415-929-1866. In the words of Food Runners director Mary Risley, "There's enough food out there for everyone. It's a matter of distribution." Sleek boats skimmed across the bay at lightning speeds, their majestic masts so high they seemed to scrape the sky. Bystanders packed the waterfront from the shores of Tiburon to the Ferry Building and beyond. The 34th America's Cup race brought thrills, crowds and excitement to San Francisco all summer long. For Food Runners, it all started in June with Levy's Restaurant, the company contracted to supply the food at the America's Cup Pavilion. Security was tight. Lockdown tight. "May I see your ID," intoned the right-out-of-Central-Casting-security-guard stationed at the entrance of Pier 29 1/2. Food Runners flashed a driver's license. The guard gave Food Runners a long, slow once over in that way that women do when eyeballing a rival's gown at an opening night gala. "Who are you here to see," the guard quipped, all serious business. 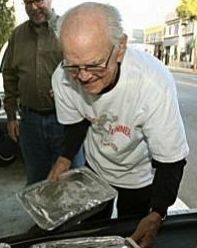 "Dan with Levy's," replied Food Runners. "Wait here," the guard instructed. Following 10 minutes of unintelligible walkie-talkie crackle between security and an unknown source, Dan of Levy's emerged from the inner gloom of the cavernous pier, riding a mini flatbed piled high with trays and boxes of food. Sliced meats and cheeses by the pound. Trays full of corn on the cob. Burritos by the dozen. And more. So much more. Enough to fill the Food Runners volunteer's mini-van leaving barely enough room to see out the back window. Pull in here. Wait for security clearance. "It was our first weekend," Dan explained. "We really didn't know how what to expect. 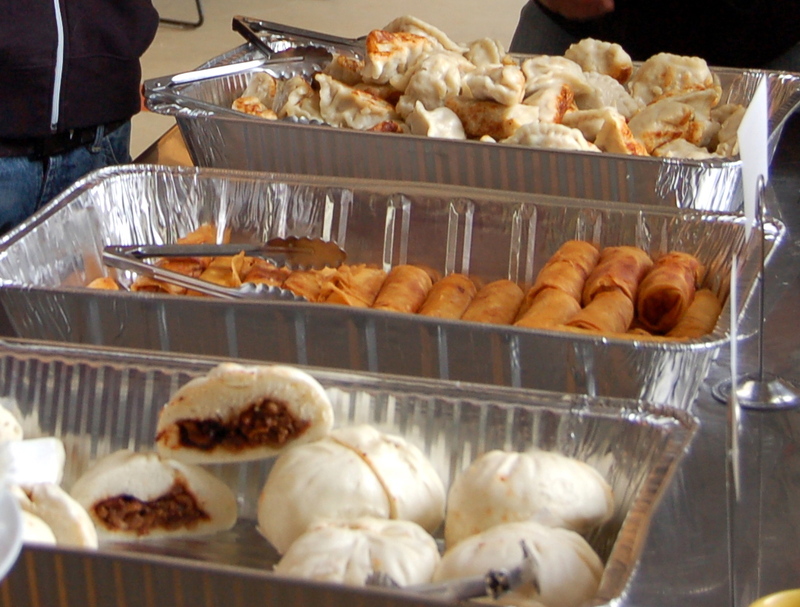 It's doubtful we'll have amounts like this regularly, but can Food Runners come whenever we have extra?" "Absolutely!" Food Runners responded. Levy's called with donations numerous times over the course of the America's Cup events. Not long after Levy's initial call, America's Cup/Live Nation called. "I'm the caterer who provides the back stage food for the cast and crew for all of the shows in the America's Cup Concert Series," Jill stated. "We'd like to get a pick up at the end of each show for all ten shows. There's always good food left over and I can't stand throwing it away. I can't believe what a wonderful service Food provides. Are you able to come around 9PM for all ten shows?" "Yes! Yes! Yes!" exclaimed Food Runners. No brainer. Every pick up contained a major feast of one sort or another. One donation even included a gorgeous bouquet of flowers for Karyn, the volunteer on the job, bestowed by Jill as a thank you to Food Runners. Typical America's Cup/Live Nation pick up. To top things off, the annual Oracle Open World Convention coincided with the final week of the America's Cup festivities making the last week in September one of the busiest weeks in Food Runners history. For a whole week, San Francisco was awash in excess food. For a whole week, Food Runners made sure that, all over town, agencies feeding the hungry got a piece of the pie. "San Frantartica." "Fogust." "The coldest winter I ever spent was August in San Francisco." Must be summer in San Francisco. Yep. It's gray. It's windy. It's cold. But not at Food Runners where all the great summer happenings and events heat things right up. By noon on Friday, August 9th, hoards of folks will begin streaming into Golden Gate Park. Purple hair, tie dyed shirts and flowing, flounced skirts will abound. Over amped strains of rock n' roll will shatter the quiet neighborhoods west of Crossover Drive. This year's Outside Lands will be underway. All three loud, crowded, freezing, foggy days of it. The festival will dominate the western end of Golden Gate Park from Friday, August 9th thru Sunday, August 11th. An average of 60,000 concert goers are expected to attended each day. That's a lot of people in need of sustenance. Sustenance which will be supplied by food vendors like Escape from New York Pizza, 4505 Meats, American Grilled Cheese Kitchen and many, many more. In addition, the festival's artists and tech crew of over 150 will require three full meals daily which will be catered to perfection by Chef's Touch Catering. Altogether, that translates into a mountain of prepared food that will generate a mountain of leftovers. 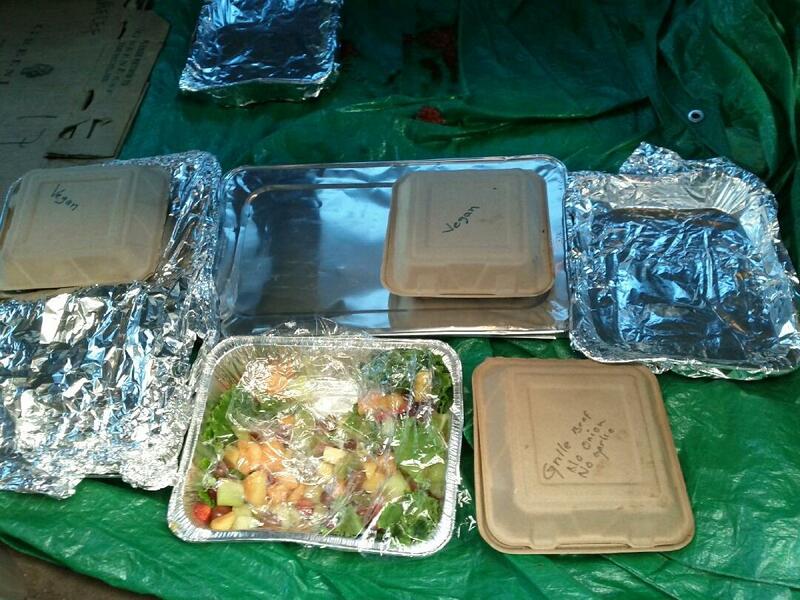 Leftovers that will be picked up by Food Runners. For three nights in a row, a small crew of Food Runners volunteers will converge on the Polo Fields at 10PM. They will be driven around the festival grounds on golf carts, to various food stations, where they will collect donations set aside by the many vendors. It's a big operation involving all kinds of security measures, expert coordination and complicated logistics on the part of the festival staff who are thrilled be to be partnering with Food Runners for the third year in a row. On the other side of town... the very next weekend... Food Runners volunteers will be on scene at the close of La Cocina's two big summer events: The Night Market on Friday, 8/16 and The Street Food Festival on Sat, 8/17. Both events promise excellent donations from the many vendors participating in the fun. La Cocina Night Market in full swing. Been following The America's Cup? Food Runners has. Levy's Restaurant, selected by the America's Cup as the official restaurant partner to the "Summer of Racing," has been making spectacular donations since mid-June. In addition, Food Runners just began receiving equally spectacular donations from the backstage caterer to the artists and crews of the America's Cup/Live Nation concert series. The donations from both groups will continue through the close of the America's Cup events in October. Zowie! Car full of America's Cup! Get out your parkas and rub your hands together for another great San Francisco summer. If you know of events where food plays a part, call Food Runners. 415-929-1866. Our volunteers will see to it that excess food from this summer's events goes to San Franciscans in need instead of the compost bin. 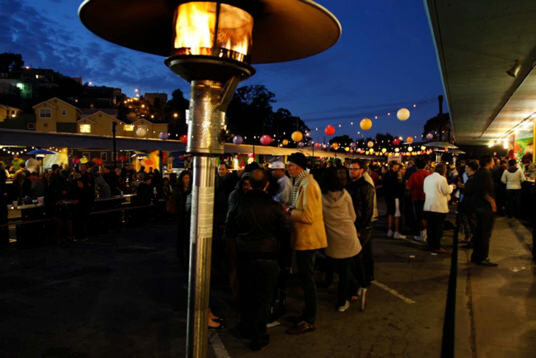 Food Runners is a simple way to warm up those famously frigid "fog days" of summer in San Francisco. "Are the heads on?" asked Chef Danny Higginbotham of Walden House, excitement rising in his voice. When the answer came back in the affirmative, Danny clapped his hands. "Yes, we'll take 'em!" he exclaimed with a fist pump. "I'll make head cheese. I love head cheese. I can teach some of the guys how to make it too. 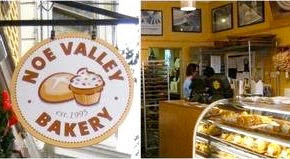 It'll be a great learning experience and delicious too." "I work for Taylor Collaboration, a medical lab that tests and creates artificial joints," wavered the tentative voice on the Food Runners message line. "My company will be receiving three whole pigs tomorrow. We only need the legs. I was wondering if Food Runners could use the rest. 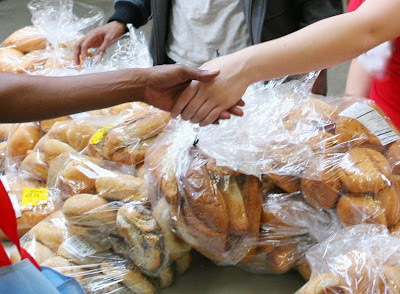 It would be a crime to throw so much good food away when there are so many folks in need. The pigs come to us already hung and butcher ready. They just need a place to go where there's a professional cook who knows how to handle them." Wow. Whole pigs. A Food Runners first. "Do you have any idea how big these things are?" Food Runners truck driver Dave pronounced into the phone when he first laid eyes on the pigs. "They must weigh 150 pounds a piece! Good thing I have Jim today." Dave was referring to volunteer assistant Jim who was helping out on the Food Runners truck that day to fulfill his Project 20 community service hours. "What a great way to do my hours," Jim exclaimed. "Food Runners is always such an adventure. You never know what you're going to get. Picking up the pigs was awesome." 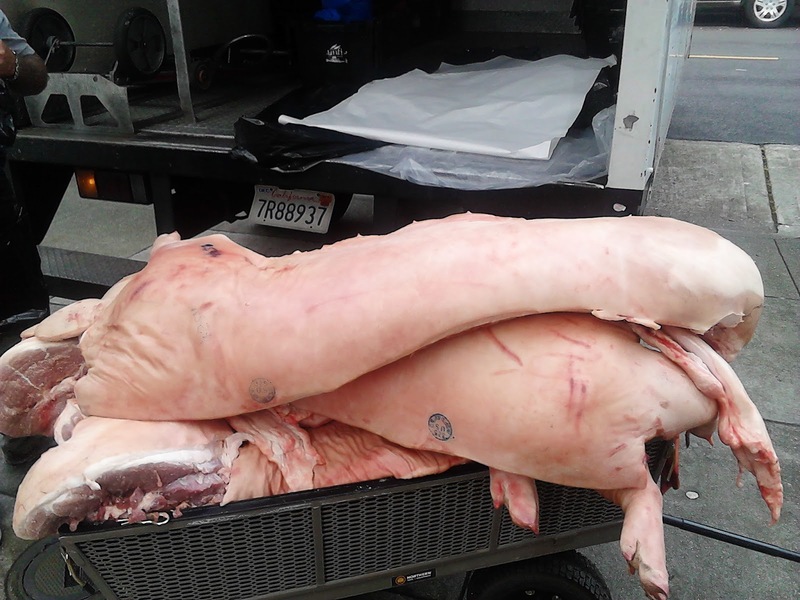 In an email from Chef Danny... "Thanks for the pigs. They went a long way and fed a lot of people. All of our programs got some. Walden House loves Food Runners." "Hi it's Peter from Taylor Collaboration again," came a familiar voice on the Food Runners message line. "Remember me? I'm the one who called a month ago with the whole pigs. We're getting three more next Tuesday. Can you do this again?" We can and we did. Side of bacon anyone? 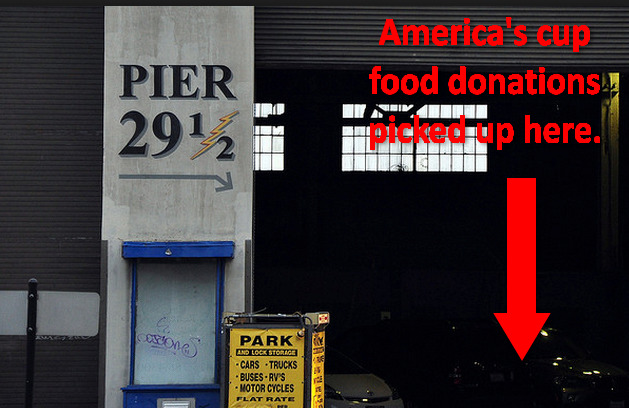 Nutritious food is still being thrown away every day in San Francisco. 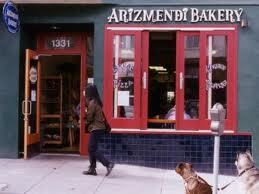 Did you know that 1 in 4 San Franciscans don't have enough to eat on a daily basis? Tell your friends and local food related businesses about Food Runners. Helping to alleviate hunger and prevent waste is just a car ride away and a phone call away. 415-929-1866. Happy New Year! Traffic is worse than ever. Rents are sky high and getting tickets to any kind of function in town is impossible. All because business is booming. San Francisco is on a roll. A big one. Start ups, social media and other tech companies continue to flock the to City by the Bay in record numbers. Fortunately for Food Runners, the growth of the local technocracy has meant more food available for donation. A good thing too, since, along with tech jobs and rents, hunger in San Francisco is on also the rise. The "senior tsunami" continues to swell, in addition to which, many average folks are having a hard time making ends meet as San Francisco's cost of living spirals ever upward. Food Runners is in the trenches daily helping to stem the tide. Check out Food Runners top 10 highlights from 2012. 10) T-SHIRTS TOO: Guillermo Alberto Ramos Espinoza of Kensington, MN won the 2012 SF Men's Urbanathlon held on Sunday November 18th, crossing the finish line with a final time of 1:04:43. After the race was over, done and wrapped, another kind of winning took place. Food Runners volunteer Sam E. showed up at Marina Green to pick up the leftover food: bananas, oranges, power bars and the like. Along with the food, the event donated a huge box of red, Urbanathlon t-shirts. The clients at City Team couldn't believe their luck. Full bellies and something clean and dry to wear. All in a day's work! 9) TEACH YOUR CHILDREN WELL: You're never too young to perform community service. On March 29th, the Town School second grade class prepared approximately 50 bagged lunches for donation. On October 30th, the St. Finn Barr School third grade class baked 100 kid sized loaves of bread for donation. Both donations were picked up by Food Runners volunteers. Both donations went to programs serving children in need. From kids to kids. A perfect circle. 8) DINE, DANCE, DONATE: Have you ever attended an event at the Julia Morgan Ballroom? It's so swank. It's so elegant! And starting this holiday season, it's so community focused. On November 27th, Mike at the Ballroom answered the phone and listened to the Food Runners appeal to never throw away edible food. The next day, Mike sent Food Runners a schedule of all the Julia Morgan holiday events at which he suspected there would be leftovers. 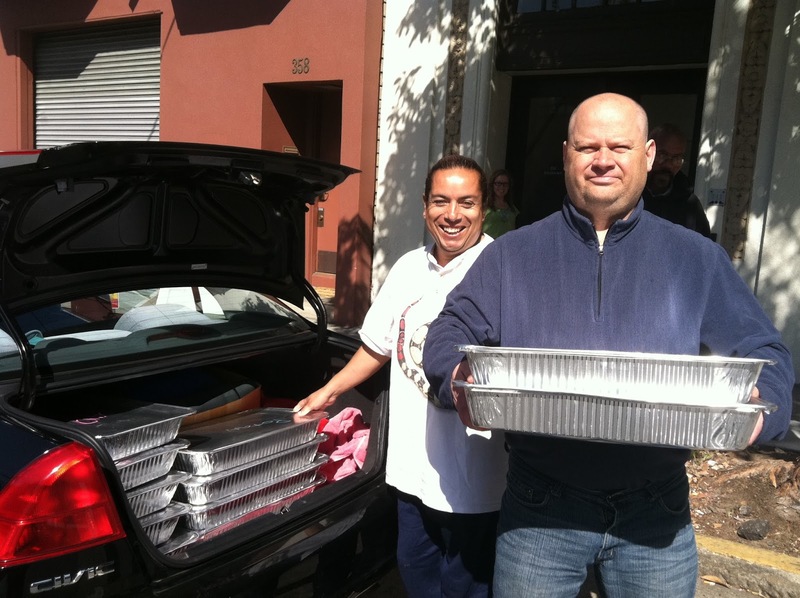 Food Runners volunteers picked up from more than a dozen Julia Morgan functions in the month of December. That's whatchya call swellegant! 7) SPECIALLY FOR DONATION: 25 Lusk, a gorgeous SOMA spot to dine, joined the rarified world of Food Runners "planned overage" donors. Once a week, 25 Lusk prepares a delicious, nutritious entree specifically for donation to Food Runners. The offering usually serves approximately 20-30 people. 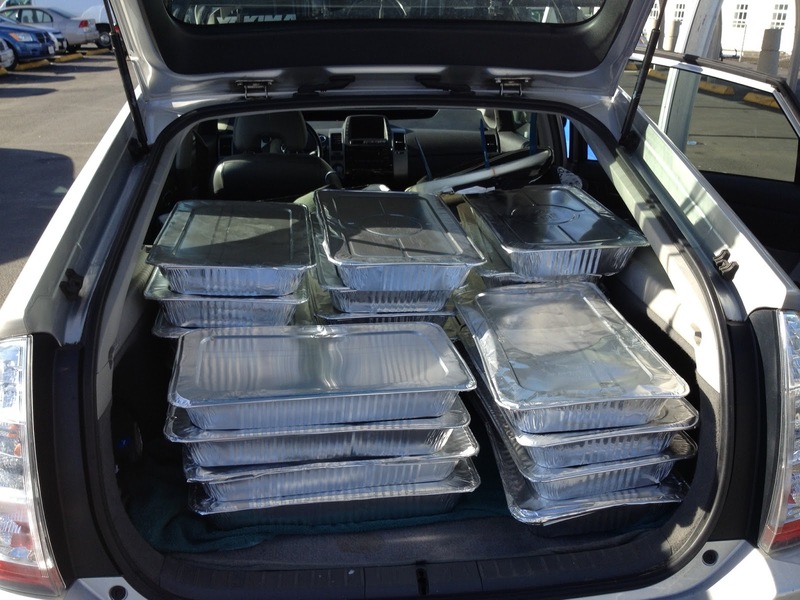 The pans are so heavy with the marvelous smelling concoction, that regular volunteer Wanda C's arms get tired transporting the food from the 25 Lusk's kitchen to her car. The tenants at the Washburn Residence love Wednesday nights. 6) TWO FOR THE PRICE OF ONE: Oracle World/Dream Force. Dream Force/Oracle World. Ellison/Benioff. Benioff/Ellison. Ah! It was conventions wars and the big winner was... Food Runners. Where there used to be one huge, food producing convention in the fall, now there are two. For ten beautiful days bridging the last week of September through the first week in October, Food Runners was cross-eyed busy transporting excess food to those in need. 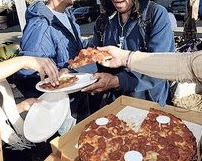 Donations included over 1,000 boxed lunches per day on convention days, as well as large donations of catered food leftover from evening social events. It positively rained food during Dream Force and Oracle World. A little competition goes a long way. Thanks Larry and Marc! 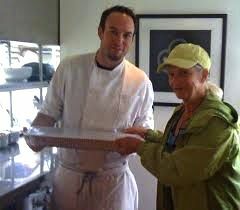 5) FOOD RUNNERS ELVES AID SANTA: Santa lives in SF in the body of Chef Tim Stewart at McCall's Catering. 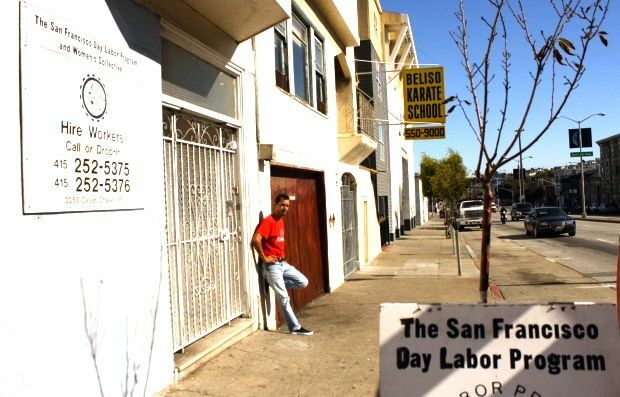 For the second year in a row, Tim has used his culinary expertise along with the vast McCall's kitchen, to prepare Christmas Dinner for for 400 for the Sisters of Fraternite Notre Dame to serve at their tiny soup kitchen located on one of the toughest blocks in the Tenderloin. Food Runners got into the act last year by connecting Tim with the Sisters and, this year, by sending volunteers Karyn, Jane, Lara and Alexa to transport Tim's beautiful dinner from the McCall's kitchen to Fraternite Notre Dame where is was cherished and enjoyed by a very needy population. 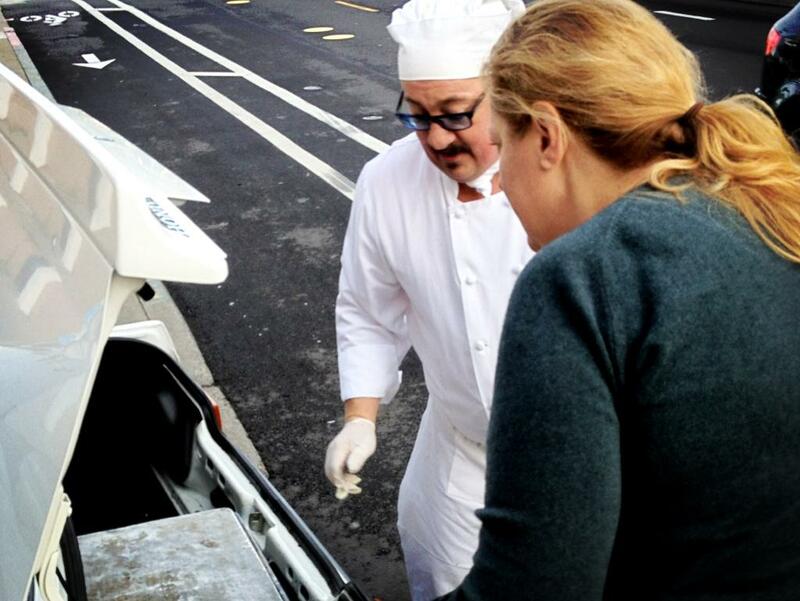 Volunteer Jane S. loading Chef Tim's Christmas dinner for transport. 4) START-UPS DISCOVER FOOD RUNNERS: It started in June with a call from Zero Cater. Almost overnight, the entire start-up community became aware of Food Runners. Suddenly, beginning at 1:30 every afternoon, the calls for pick ups just kept coming in as they continue to do to this day. Bright Media, Apartment List, Heroku, Rally, MoPub, Mochi Media, Luvocracy, Mocana, Square, SauceLabs, Ampush...phew! The list goes on. And the food is gurrrrrr-REAT!!! The start-up culture takes care of its peeps and cares about the community too. The recipients at places like Cameo House, which offers supportive, transitional housing to single mothers, love it when a Food Runners volunteer pulls up laden with start-up company lunch leftovers. 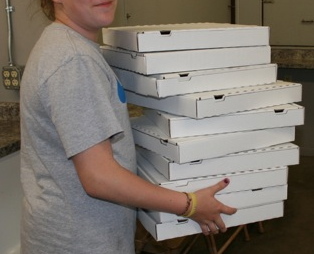 3) AMAZING CREW: The Food Runners volunteer crew is stronger than ever. 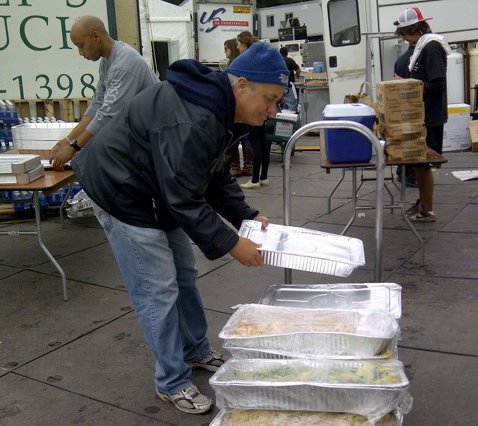 Food Runners volunteers are an amazing group of citizens dedicated to helping their neighbors in need. From the mini crews like Dawn/Dede/Mary/Lisa who meet each other on weekend mornings to collect grocery store loads too large for a single car, to the foot soldiers like Frances C. and Sam H. who are game enough to brave Friday afternoon SOMA traffic on a weekly basis, to volunteers like Florence G. who will go anywhere anytime, to super mensches like Keith G. and Erik G. who volunteer to drive the Food Runners truck for massive pick ups on a regular basis - Food Runners volunteers are performing much needed service. All the volunteers, whether they go out once a year or multiple times per week are making a difference. Food Runners could not exist without them. Volunteer William N. on weekly pick up at Garden for the Environment. 2) FOOD RUNNERS TURNS 25: Twenty-five years ago Food Runners founder Mary Risley had a beautiful, simple idea. Following a class she'd just taught at her own Tante Marie's Cooking School, rather than throwing away the wedding cakes her students had just baked, she piled them in her car and drove them to Glide Memorial Church where they were received with smiles and great appreciation. In that moment, Mary thought, "If I can do this, anyone can." Hence, Food Runners was born. 25 years later, Mary's beautiful, simple idea boasts over 250 volunteers, almost 600 donors and over 200 recipients. "I don't know how to fix the world's problems," Mary often says, "but I do know how to help my neighbor." 1) THE GREATEST GIFT: What's Food Runners greatest gift? Getting the food to those in need, of course, but perhaps something more.... From Food Runners volunteer Cheryl H. reporting on her Boxing Day run, 2012: "Good day today on the food run with first-time runners, nephew Luca, neice, Analisa and Sabrina [daughter], who loved showing her cousins her favorite pick up routes from White Swan to Marine's Memorial's top floor restaurant. This year, we decided no gifts, but instead to enjoy doing a food run together. We filled the station wagon with boxes of food for North Beach Citizens. We found parking right in front. The workers and the clients were so grateful to receive everything we brought them. Boxing Day became filled with a whole new meaning...!" Sabrina teaching cousins the Food Runners ropes.